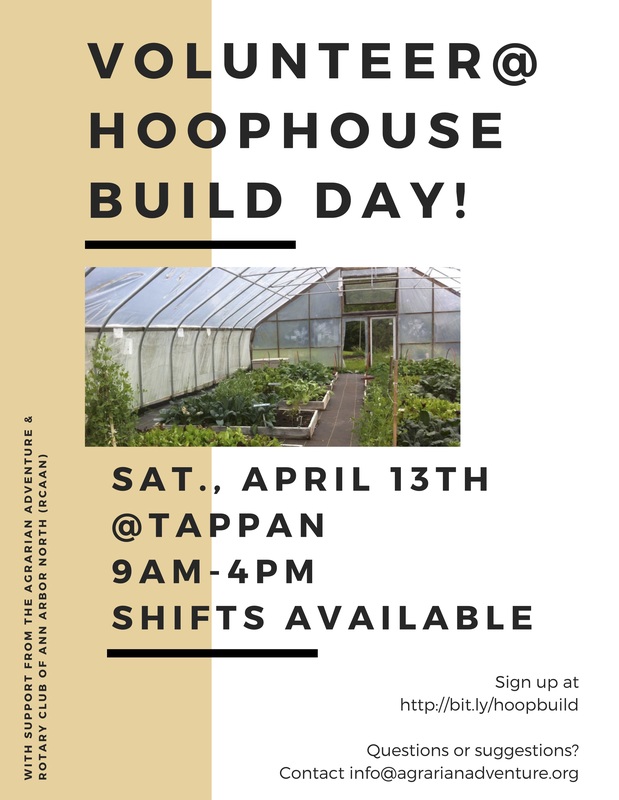 The Agrarian Adventure needs volunteers for a community hoophouse restoration at Tappan Middle School (2251 E. Stadium Blvd.)! Please join us on Saturday, April 13th between 9am-4pm for a day of action to revitalize the structure. We will be replacing wood and stretching new plastic on the hoop. More than one shift is available, and if they don’t work for you just email us at info@agrarianadventure.org to let us know. Please sign up in advance so that we can plan to provide food for everyone. This project is supported by a grant from the Rotary Club of Ann Arbor North (RCAAN). Are you passionate about youth education, health or school gardens and agriculture? If so, consider sharing your talents as a member of The Agrarian Adventure Board of Directors. We are currently seeking to fill two board positions to complete a two year term supporting the mission of our nonprofit organization to use experiential education to connect students to the sources of their food and empower them to transform their lives and food culture in positive ways. The two open chair positions are listed below, however board members do not have to fill these specific roles and can contribute other skills collaborating on fundraising, evaluation and programs. Complete this google form by March 15th to apply. Questions can be sent to info@agrarianadventure.org. The Communications Chair works with staff and board members to manage The Agrarian Adventure social media, website and newsletter communications. This primarily includes use of Instagram, Facebook, Mailchimp and WordPress, but also involves working with the team to organize and store photographs of The Agrarian Adventure programs and related photo permissions. A successful candidate need not have experience on all of these platforms as they will work as a team and the programs are relatively easy to learn. The Finance Chair oversees The Agrarian Adventure expenditures and manages staff payment including receiving invoices and reimbursement requests as well as issuing checks and tax forms. This is a good position for someone who has an interest in developing these skills or someone who already has experience in finance or accounting who wants to contribute to their community. The Agrarian Adventure board members contribute to stewardship of the organization including support of our mission and raising funds for mission-based programming. While all board members collaborate on fundraising, a small subset takes the lead by generating creative ideas, communicating with community partners and developing yearly fundraising goals and timelines. Check out the 2018 Annual Report! This year The Agrarian Adventure had programming in 48 classrooms with more than 15 schools. Join us for a morning of good food and good company to support a good cause! 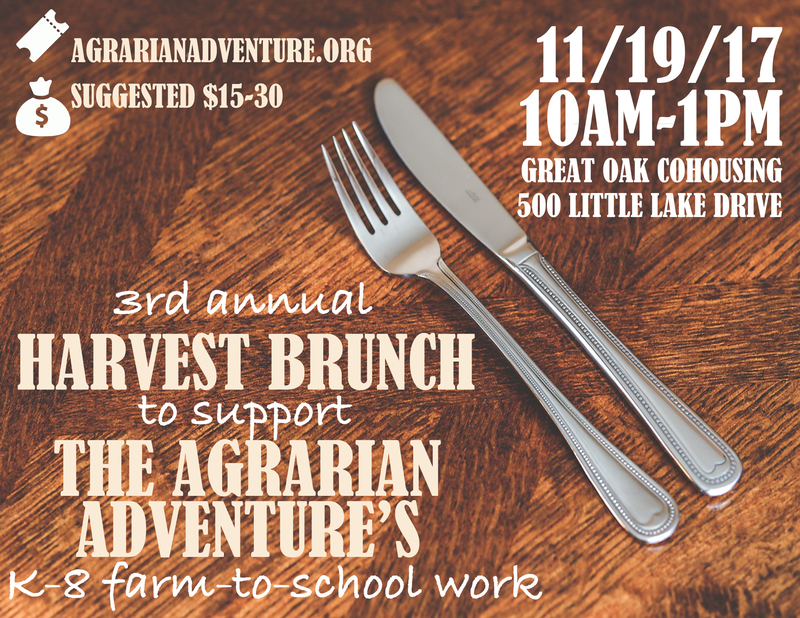 All proceeds benefit The Agrarian Adventure’s ongoing farm-to-school programming. You won’t want to miss this menu! Some of our favorite chefs will serve creative dishes made with ingredients from local farms and businesses. We’ll post more details about the menu as they become available. Purchase tickets ahead of time at the bottom of this post (recommended), or at the door. 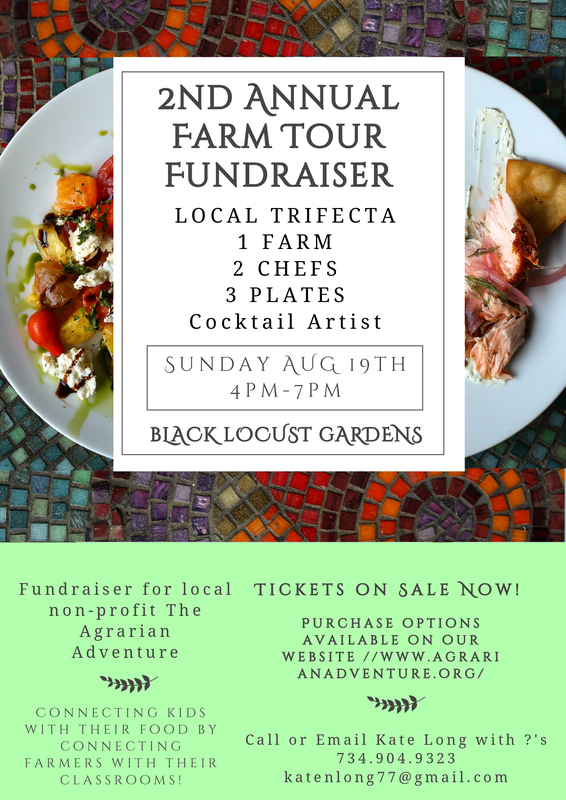 Join us for our second annual farm tour fundraiser! The evening will include cocktails, small plates in three courses, a chance to mingle with the farmers, and a hay ride and farm tour. We are thrilled to be hosted by Black Locust Gardens, a farm dedicated to sustainable agriculture. We’re also thrilled to have some talented folks working on the menu! You’ll see Jude Walser (Alley Bar) mixing drinks, and Chefs Chris Chiapelli (Black Pearl, Ross School of Business) and Chris Huey (Brecon Grille & Pub) creating delicious small plates. Tickets can be purchased at the link below. Hope to see you there! *Parking will be available; car pooling is encouraged! Chef Chris Huey’s Modernist Play on the Caprese Salad using Gaff Farms Heirloom Tomatoes, Recovery Park Farms Heirloom Cherry Tomatoes and Baby Cucumbers, Zingermans Marinated Baby Mozzerella and Marinated Olives, Pomegranate Molasses and Bacon Jam, garnished with Skinny Farms Fresh Basil. Tantre Farm Roasted Heirloom Carrots seasoned with Roos Roast Coffee grounds, Cumin and Coriander. Black Locust Gardens Lime Basil/Kale Puree (made also with using Black Locust Garden Caramelized Onions, Tantre Farm Garlic, and Zingerman’s Onsa’s Extra Virgin Olive Oil), Whitney Farms Grilled Beef rubbed in Mindo Cocoa Powder served with Fluffy Bottoms Vanilla Yogurt and garnished with Black Locust Gardens Lavender and Tulsi Flowers. Chef Chris Huey’s Skinny Farm Basil Sorbet and Chef Christopher Chiapelli’s Black Locust Gardens Sun Gold Tomato Ice Cream. Special diet? We will make every effort to meet vegetarian, vegan, gluten-free, or dairy-free requests. Meals can be cooked with oil, butter, or bacon fat, depending on dietary needs. Tickets are available at the door or in advance (see below). Limited time left to buy a ticket! 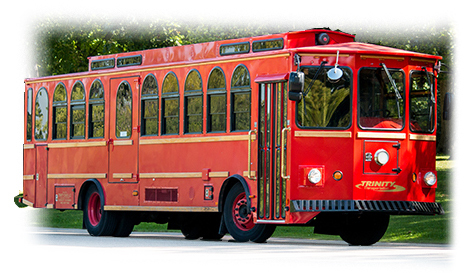 The Agrarian Adventure invites you to a trolley tour of three local farms! Each stop will feature a different chef and a different farm and include a short tour. Specialty cocktails will be available with our guest bartender Jude Walser from the Alley Bar. Chefs include Chris Chiapelli (Ross School of Business, Black Pearl), Chris Huey (Mediterrano) and Chef James Raynak (Robin Hills Farm). This special trolley tour will pick up at 4pm (and drop off at 9pm) at the last stop of the third annual Ann Arbor Farm to School Collaborative Garden Tour at Pittsfield Elementary School. Be sure to check out information about this great, free school garden tour taking place before the trolley trip! Tickets for the general public are priced at $150. Sustaining members of The Agrarian Adventure are eligible to purchase tickets for reduced prices of $75 or $100. Become a sustaining member by signing up to donate a monthly amount to The Agrarian Adventure for a year! Links for ticketing and sustaining membership are available below (be sure to complete both the ticket purchase and the monthly donation if you decide to become a sustaining member). Please send any questions to bmcqueer@gmail.com. This year The Agrarian Adventure worked with over twenty schools and impacted more than 1,000 students! Read more in the FY2017 Annual Report.